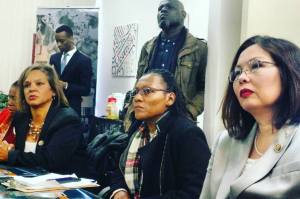 After months of advocating, educating and rallying community members, IMAN organizers and leaders celebrated the passage of the Removing Invisible Bars Bill (SB 2282) through the Illinois Senate on April 22. SB 2282 was drafted under the leadership of Green ReEntry Housing Coordinator Nasir Blackwell, who himself is impacted by the harsh parole technicalities faced by the formerly incarcerated. Now the organizing team’s focus turns to the state House of Representatives, with passage through that legislative body pushing Illinois one step closer to commonsense parole reform. Organizers devoted extensive time and effort in April in order to secure the necessary support for SB 2282, traveling to Springfield several times to meet with legislators. 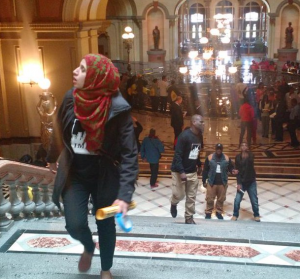 The trip to the state capitol, during the CIOGC-sponsored Illinois Muslim Action Day linked IMAN’s push for parole reform with the calls for reduced school arrests and other initiatives led by Equal Voice ally organizations such as Communities United. In the weeks to come, IMAN organizers will continue the Removing Invisible Bars campaign with an intense focus on garnering support in the House of Representatives. You can play a crucial role in helping to bring real, impactful parole reform to Illinois by contacting the following legislators and telling them that you believe in the Removing Invisible Bars bill: Elaine Nekritz, Barbara Flynn Currie, Elgie Sims, and Lashawn Ford. Interested in joining the team of organizers and leaders pushing to remove the invisible bars? Contact Shamar Hemphill today to get plugged in. IMAN deepened its relationship with members of the Congressional Black Caucus this past month through several engagements with US Congresswoman Robin Kelly (D-IL 2nd District) and others. Executive Director Rami Nashashibi was invited to a Congressional Dinner hosted by Rep. Kelly, where he shared IMAN’s work and vision with legislators from across the country. 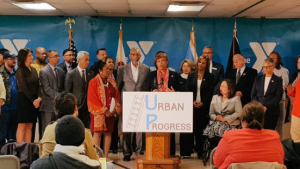 The following morning, Nashashibi stood with Rep. Kelly at a major press conference during which she outlined her crucial “Urban Progress” initiative to combat increasing gun violence plaguing urban centers throughout the nation. IMAN was specifically mentioned as a model for holistic solutions to violence. Kelly and several other members of the US House of Representatives—including Danny Davis (D-IL 7th District), Sheila Jackson Lee (D-TX 18th District), Yvette Clarke (D-NY 9th District), and US Senate hopeful Tammy Duckworth (D-IL 8th District)—toured IMAN later that day, in order to witness firsthand how the organization fosters health, wellness and healing on Chicago’s Southwest Side. The esteemed guests visited the current Green ReEntry renovation project, as well as the MLK Living Memorial construction space. This historic engagement propels IMAN toward a critical national organizing effort, wherein community organizations from across the country will be mobilized for a massive action in Washington D.C. this fall centered around powerful criminal justice reform. For more information, contact Organizing Director Shamar Hemphill. After months of preparation and planning, IMAN Atlanta hosted CommUNITY Café: 1000 Mile Journey on April 23, its debut event. A caravan of staff and leaders from Chicago hit the road and took to the skies to support this landmark effort, which was led by ATL Regional Organizer Mansoor Sabree and Ny’imah Byrd. Café guests were treated to a stellar lineup of local, national and international artists; rapper-producer Oddisee headlined the event, Omar Offendum delivered stirring and focused lyrics, independent songstress Drea D’Nur softened hearts with her powerful voice, while Quadir Lateef’s high-octane set provided the perfect opening. 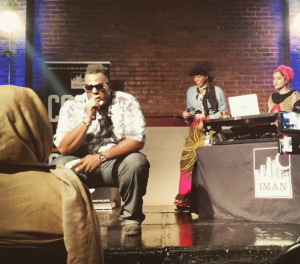 CommUNITY Café: 1000 Mile Journey was hosted by poet-authors Basheer Jones and Tasleem Jamila. While certainly a success in and of itself, CommUNITY Café: 1000 Mile Journey was part of a larger weekend program spearheaded by the IMAN Atlanta team. Greening Youth, a Georgia-based sustainability foundation, hosted an inspiring Young Leaders Forum at their four-acre location on the city’s West Side. 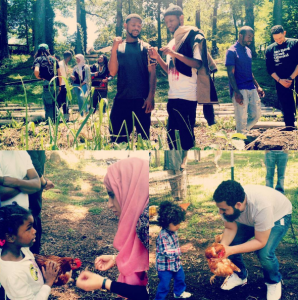 Youth from Chicago were able to tour the expansive garden site, which included a chicken coop and aquaponics system, and exchange valuable tips with peers. Omar Offendum, Drea D’Nur and Quadir Lateef joined the IMAN youth for the tour. Before heading back to Chicago, staff and leaders visited the historic King Center in downtown Atlanta. The group reflected on the legacy of King’s work and connected the IMAN-led MLK Living Memorial Project to this nationally recognized space of remembrance. 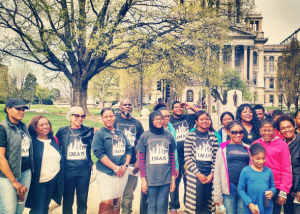 IMAN Atlanta now looks to build on the incredible momentum following April’s CommUNITY Café. Stay tuned for the latest news and updates by following IMAN Atlanta on Facebook.